What Einstein's formula tells us is that it is possible for energy (E) to convert into mass (m) and vice-versa. The speed of light 'c' is a very large number and hence c² is a phenomenally large number. The equation tells us that a very small amount of mass will convert into an extremely large quantity of energy. An example is Nuclear energy - the major form of energy that is trapped inside the atom. 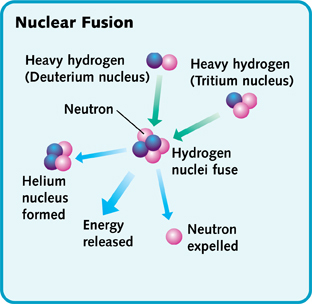 Fusion means joining smaller nuclei to make a larger nucleus. Nuclear fusion, a form of nuclear energy, is the same reaction that fuels the sun. The nuclear fusion of hydrogen atoms into helium atoms gives off heat and light and other radiation. But first let us look at where it all started. After the Big Bang, simple elements like hydrogen and helium floated about in the Universe. It was only 300,000 years later that stable hydrogen and helium atoms formed. Gradually these atoms began to clump together into gas clouds called nebulae. Over the course of the next 300 million years, these clouds grew and attracted more and more atoms. As a result they became increasingly dense and hot. In fact, after they are born, stars become huge nuclear processing plants. Unlike nuclear plants on Earth, stars don't produce energy by splitting the atom - known as 'nuclear fission'. They join atoms together in nuclear fusion. Newly born stars begin by fusing their lightest atom, hydrogen. In the core of the star, these hydrogen atoms fuse to form the next heaviest element, helium. Then when the hydrogen runs out, the helium atoms fuse together to form carbon. Then when the helium runs out, the carbon atoms fuse to form oxygen. This manufacture of heavier and heavier elements continues until the star finally dies. Nuclear fusion takes place continuously in the sun and stars. Fusion takes place in the core and causes the star to emit light. In the core of the sun at temperatures of 10-15 million degrees Celsius, Hydrogen is converted to Helium. Two types of hydrogen atoms, deuterium and tritium, combine to make a helium atom and an extra particle called neutron. In the course of this fusion reaction, a lot of energy is released and is enough to sustain life on earth. Unless there is access to the kind of temperatures present at the core of the Sun, it is very difficult to make fusion take place because the two small nuclei have to be thrown at each other at great speed in order to overcome the repulsive forces between their protons. For energy production on Earth, different fusion reactions are involved. The most suitable reaction occurs between the nuclei of the two heavy forms (isotopes) of Hydrogen - Deuterium (D) and Tritium (T); eventually reactions involving just Deuterium or Deuterium and Helium (3He) may be used. To harness the awesome power of the nuclear fusion reaction, researchers have been trying to produce fusion in a controlled manner. At the temperatures required for the Deuterium-Tritium fusion reaction, that is over 100 million degree Celsius, the fuel changes from gaseous state to plasma. In plasma state, electrons are separated from the atomic nuclei (and called ions). The scientists create miniature "suns" made of hot and dense plasma, a charged gas consisting of free electrons and positive ions. But they have not succeeded in forcing the plasma's atomic nuclei into fusing. One reason is that studying the plasma, whose temperatures reach millions of degrees, is no easy task. Scientists have been working on controlling nuclear fusion for a long time, trying to make a fusion reactor to produce electricity. But they have been having trouble learning how to control the reaction in a contained space. Nevertheless, understanding plasma has brought on major developments in physics. Plasmas are now used widely in industry, especially for semi-conductor manufacture. Fusion reactions occur at a sufficient rate only at very high temperatures. Over 100 million degree Celsius is needed for the Deuterium-Tritium reaction whilst other reactions require even higher temperatures. The hot plasma must be well isolated away from material surfaces in order to avoid cooling the plasma and releasing material atoms (impurities) that would contaminate and further cool the plasma. In methods such as the Tokamak system, the plasma is isolated by magnetic fields. The efficiency of the magnetic insulation is measured by a quantity called the Energy Confinement Time. This is the characteristic time-scale for plasma cooling when the source of heat is removed. The density of fuel ions must be sufficiently large for fusion reactions to take place at the required rate. The fusion power generated is reduced if the fuel is diluted by impurity atoms released from surrounding material surfaces or by the accumulation of Helium "ash" from the fusion reaction. As fuel ions are burnt in the fusion process they must be replaced by new fuel and the Helium ash must be removed. For the Earth, the deuterium-tritium fusion reaction contained by some kind of magnetic confinement seems the most likely path. However, for the fueling of the stars, other fusion reactions will dominate. Since the most practical nuclear fusion reaction for power generation seems to be the deuterium-tritium reaction, the sources of these fuels are important. Once the reaction is established, even though it occurs between Deuterium and Tritium, the consumables are Deuterium and Lithium. The deuterium part of the fuel does not pose a great problem because about 1 part in 5000 of the hydrogen in seawater is deuterium. This amounts to over 10^15 tons of Deuterium. Also, Deuterium is abundant as it can be extracted from all forms of water. If all the world's electricity were to be provided by fusion power stations, Deuterium supplies would last for millions of years. As a potential fuel for a fusion reactor, a gallon of seawater could produce as much energy as 300 gallons of gasoline. The tritium part of the fuel is hard to source, since tritium is radioactive with a half-life of about 10 years. It would have to be obtained by breeding the tritium from Lithium. Tritium does not occur naturally and can be manufactured from Lithium within the machine. Lithium, the lightest metal, is plentiful in the earth's crust. If all the world's electricity were to be provided by fusion, known reserves would last for at least 1000 years. For example - 10 grams of Deuterium, which can be extracted from 500 liters of water and 15g of Tritium produced from 30g of Lithium, would produce enough fuel for the lifetime electricity needs of an average person in an industrialized country. Nuclear Fission, on the other hand is the reaction when the nucleus of an atom is split apart. This is accompanied by the release of enormous amounts of energy, which is both heat and light energy. This energy, when let out slowly, can be harnessed to generate electricity. When it is let out all at once, it can make a tremendous explosion in an atomic bomb. Inside the reactor of an atomic power plant, uranium atoms are split apart in a controlled chain reaction. Particles released by the splitting of the atom strike other uranium atoms splitting those in turn and the sequence continues to result in a chain reaction. In nuclear power plants, control rods are used to keep the splitting regulated so it doesn't go too fast. The chain reaction gives off heat energy. This heat energy is used to boil water in the core of the reactor. So, instead of burning a fuel, nuclear power plants use the chain reaction of atoms splitting to change the energy of atoms into heat energy. If the reaction is not controlled, you could have an atomic bomb. Here, almost pure pieces of the element Uranium-235 or Plutonium, of a precise mass and shape, must be brought together and held together, with great force. The nuclear fission reaction also creates radioactive material and could be harmful if released. This material therefore needs to be kept in solid form. What's better about nuclear fusion is that it creates lesser radioactive material than fission, and its supply of fuel can last longer than the sun. The advantages of Fusion are that it provides a vast, new source of energy, where the fuels are available in plenty. Most importantly, there is no polluting impact on the atmosphere that could otherwise lead to acid rain or greenhouse effect.